SOLIDWORKS World 2016 will be held at the Kay Bailey Hutchison Convention Center in Dallas, Texas on January 31 – February 3 . Save $200. 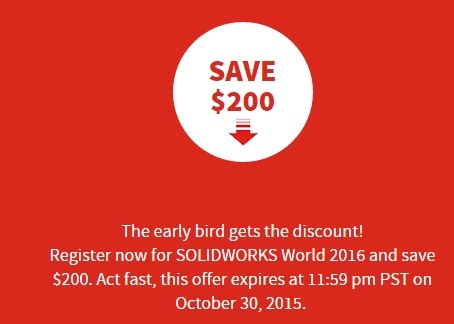 Act fast, this offer expires at 11:59 pm PST on October 30, 2015. To Register Click on Image above ! There is a T- Shirt Design Contest going on For SOLIDWORKS users like You ! Click on Below Image for more info.